Continue Reading "Gakkou Gurashi! – 12 (END)"
Continue Reading "Gakkou Gurashi! – 11"
There’s times where you want to be correct about things and times you wish you were wrong. This week was one of those times I wish I was wrong. Continue Reading "Gakkou Gurashi! – 10"
After the bombshell at the end of last week’s episode, it looks like we’ll have to wait one more week until we find out just what secrets are hiding down in the second basement. Continue Reading "Gakkou Gurashi! – 09"
If this week’s episode was any indication where the story’s about to go, we’re going to be in for a bumpy ride. Continue Reading "Gakkou Gurashi! – 08"
I think this week’s episode totally counts as the calm before the storm. Continue Reading "Gakkou Gurashi! – 07"
Even though I already knew exactly what was going to happen, it didn’t stop the tears from flowing as the episode came to a close. If anything, I think I was crying a lot more than I should have specifically because I knew what was coming. Continue Reading "Gakkou Gurashi! 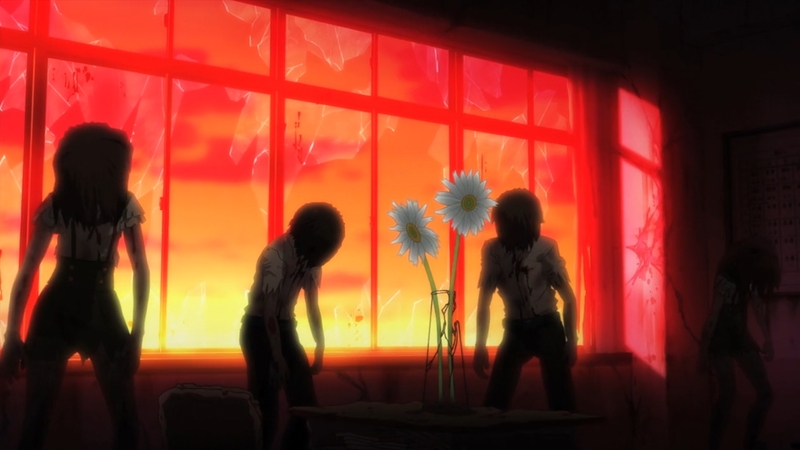 – 06"
Continuing on from last week’s episode, this week’s had a nice combination of happy-go-lucky moments with a pinch of complete despair and realization about just how bad things really are. Continue Reading "Gakkou Gurashi! – 05"
No one lives in a world like Gakkou Guarashi’s without experiencing some sort of hardship. Continue Reading "Gakkou Gurashi! – 04"
I think this might be the last episode where we get any hand holding. Continue Reading "Gakkou Gurashi! – 03"
Before you ask anything else – yes they updated the opening sequence ever so slightly to reflect what’s going on. THAT’S DEDICATION I TELL YOU WHAT. Continue Reading "Gakkou Gurashi! – 02"
I’ve been dying to find out how Lerche was going to handle their adaptation of Gakkou Gurashi and I loved it for the most part. Continue Reading "Gakkou Gurashi! – 01"